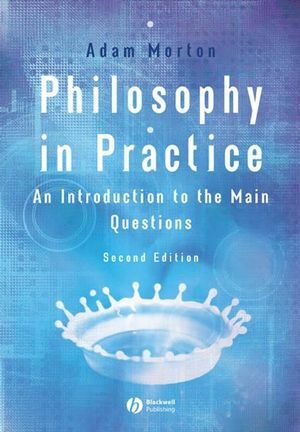 Philosophy in Practice is a completely new kind of introductory philosophy textbook, focusing on philosophy as an activity, rather than as a doctrine. Thoroughly revised edition of a popular introductory philosophy textbook. Contains new discussions of philosophy of religion, freedom, The Matrix, and the epistemology of the internet. Offers a wealth of pedagogical features to guide students through the text, including discussion plans at the beginning of each section, questions, chapter summaries, annotated guides to further reading, and a glossary. Classic passages from the history of philosophy are used throughout, and each part ends with a one-page historical summary. Adam Morton is Professor of Philosophy at the University of Oklahoma. He has previously taught at Princeton University, the University of Ottawa, and the University of Bristol. His publications include Frames of Mind (1980), Disasters and Dilemmas (Blackwell, 1991), The Importance of being Understood: Folk Psychology as Ethics (2002), A Guide Through the Theory of Knowledge (third edition, Blackwell, 2003), and On Evil (2004). Part I: The Lure of Certainty:. 4. Rationalism versus Relativism in Morals. 6. The Retreat from Certainty. Postcard History of Philosophy I. Part II: Life in an Uncertain World: . Postcard History of Philosophy II. Postcard History of Philosophy III.